A creamy blend of goat cheese, accented with honey, hand wrapped in buttery phyllo pastry, and topped with a brown sugar crumble. Wanting to elevate your menu offering with an elegant sweet and savory bite? Look no further than Kabobs’ Goat Cheese & Honey Phyllo Crisp. 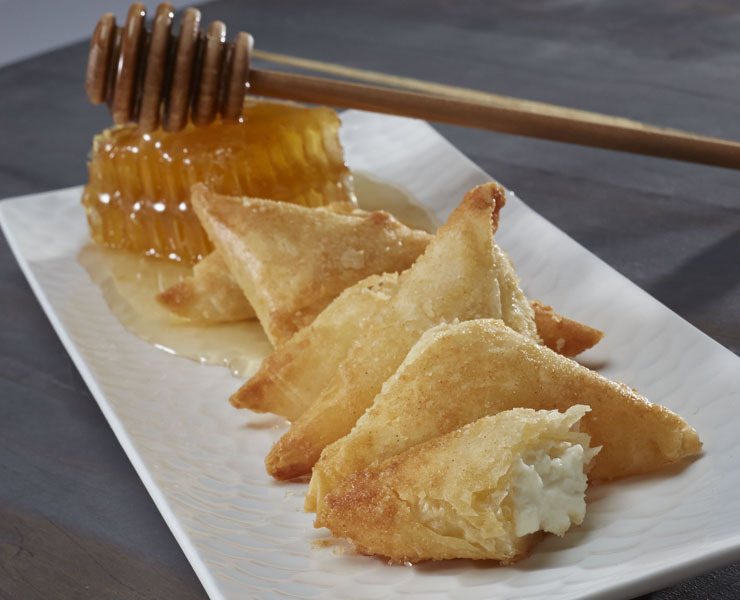 Our culinary team paired the sweet flavors of wild clover honey and married them with a blend of fresh goat and cream cheese, then hand wrapped in thin buttery phyllo pastry. For a prefect finish, we then hand brush a brown sugar crumble, to create a crisp, sweet exterior. The subtle sweetness, of this elegant-style hors d’oeuvre provides a much-needed enhancements to mid-morning breaks, passed hors d’oeuvres, and small dessert plates. From frozen bake in a 400º F convection oven for 4 - 6 minutes. Andouille Sausage and spicy pommery mustard wrapped in puff pastry for a truly unique flavor. A Southern Coastal favorite. A whole shrimp, marinated in a hardwood smoked BBQ sauce, placed on a savory hand-formed grit cake, with Tasso ham, green onion, and blackened seasoning. A plump fig, marinated in aged balsamic vinegar, nestled on a rosette of goat cheese and bacon, on a hand cut flatbread. Two tender cubes of sirloin, red and green peppers and onions on a 6" skewer. Crumbled hardwood smoked bacon, folded into a smooth, satiny quiche custard of Swiss and Monterey Jack cheese, fresh eggs, and rich cream. An aromatic, crisp flatbread, paired with a zesty marinara sauce, topped with fresh buffalo mozzarella, marinated in olive oil infused with basil, accompanied with a marinated tomato. Potato Au Gratin Dauphinoise - Sliced potato, heavy cream, Gruyere and cheddar cheese. Fresh, sweet Blue Swimming jumbo lump crab meat, accompanied by a light savory blend of Old Bay seasoning, zesty Dijon mustard, creamy mayonnaise, and fresh hand-cut green onions.